Whether in the kitchen, bedroom or living area, all applications are possible with TANDEMBOX. TIP-ON BLUMOTION for TANDEMBOX combines modern design with a high quality of motion, assuring that furniture is impressively easy to use and aesthetically appealing. TIP-ON BLUMOTION for TANDEMBOX provides more design freedom to achieve handle-less design. Design freedom supported by the right technology is now possible with TANDEMBOX intivo and TANDEMBOX antaro drawers and pull-outs. The addition of TIP-ON BLUMOTION for TANDEMBOX has extended the support solutions available for handle-less designs and completes the TIP-ON BLUMOTION range from Blum. TIP-ON BLUMOTION for TANDEMBOX is a welcomed addition to Blum’s motion technology range, with the innovative motion technology creating new design opportunities for the popular Box system. TIP-ON BLUMOTION introduces cutting-edge technology that combines the convenient opening of TIP-ON with the reliable function of BLUMOTION for a 100% mechanical opening and soft-closing support system that offers a harmonious and convenient experience when opening drawers and pull-outs. In readiness for TIP-ON BLUMOTION for TANDEMBOX, the TANDEMBOX program went through a series of technological developments to optimize performance. Important functions have been re-engineered to improve operating characteristics that offer an even greater quality of motion with lighter opening forces, improved stability and smoother running action. TIP-ON BLUMOTION is an ideal mechanical solution for handle-less drawers and pull-outs in all living areas throughout the home, ensuring that furniture is easy to use and aesthetically appealing. Assembly and adjustment are key when it comes to getting the most out of minimalist furniture design. The clear-cut design and gap layout of handle-less furniture design is impressive; Blum’s motion technologies enable a small front gap of just 2.5 mm and components can be assembled tool-free, taking very little time to adjust and create a precise and uniform gap layout. 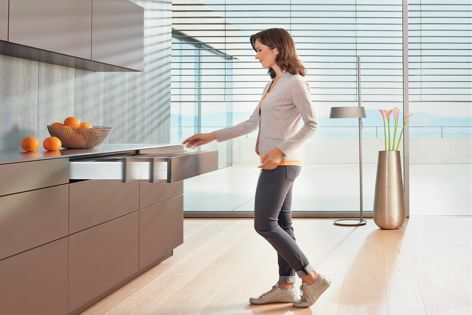 Blum’s range of motion technologies supports the design of handle-less lift systems, doors and pull-outs: BLUMOTION, SERVO-DRIVE, TIP-ON BLUMOTION and TIP-ON not only make it easier to open and close furniture, they also make the opening and closing motions a mesmerizing experience. 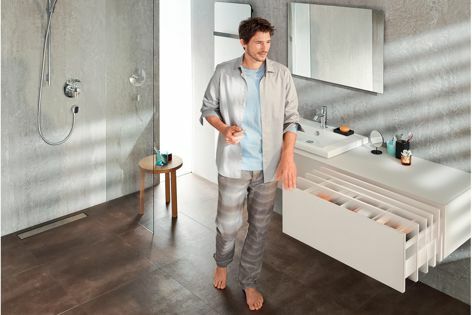 Design possibilities are endless when furniture is fitted with Blum hardware solutions and motion technologies – Blum combines modern designs with high-quality motion. Handle-less furniture designs can be created with minimum effort and furniture tailored to individual users’ needs, taste and style.